I love Valentines Day. I'll admit it - as uncool and lame as some of you will think that is, I get a real kick out of it. This year on our make up Valentines Day (he spent the real V-Day working) I was annoying my husband by chronicling one of our adventures with a present he got for me on facebook and twitter when I suddenly realised that I wasn't just mindlessly taking photos with my iPhone, I was illustrating two really important things - and all with coloured straws. The present, as you can see from the photo was a very groovy straw joining kit that allows you to drink out of 2 (or more I've just realised) drinks at the same time while having all the bendy fun you can handle. I'm not sure that the cute kids on the box illustrate that it should be used with cocktails, but you get the point. 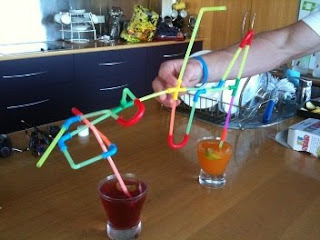 The kit consisted of over 200 pieces and after tearing it open my husband and I got to work, each designing our half of the straw concoction, neither looking at each other while we worked (we were far too consumed with our design job). We only saw each others creations when we joined them at the yellow connector after we had completed them. Despite working from exactly the same pieces, our solutions were completely distinct and unique. Mine is right hand side - all high and a symmetrical across a diagonal point. My husband's (showing his very creative brain) is like a roller coaster and is completely 3 dimensional (which didn't even occur to me). In a work environment I've always believed that before you do a joint or group brainstorm for issues, each individual should have their own brainstorm first so that they're not influenced or biased and have an opportunity to put forward their best and most creative ideas. Left to brainstorm this problem together we might have influenced each other and we would have missed the unique solutions to the problem each of us made on our own. Now - off to find two more cocktails and rework an even more sophisticated straw solution!